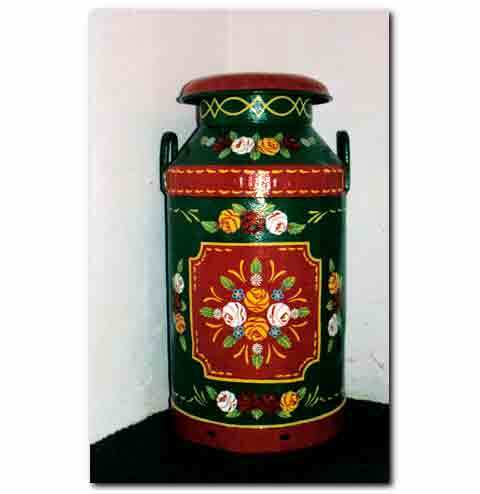 What is Canal Folk Art? Narrow boat painting, or canal art is a traditional British folk art. This highly decorative folk art once adorned the working narrow boats of the inland waterways of Britain. Canal ware, barge ware, or gift ware, are used to describe decorated trinkets, and household items, rather than the decorated narrow boats. 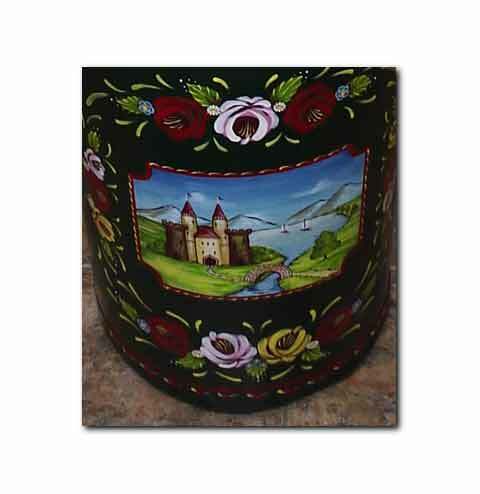 Canal ware is typified by strong vibrant contrasting colours, stylised roses and castle scene panels. 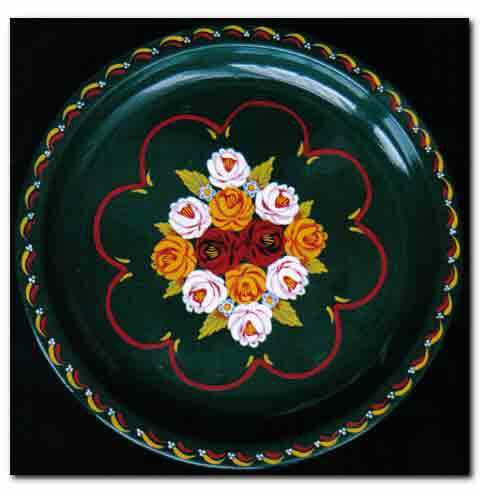 Traditional barge ware items are highly decorated, with little blank space in the design. No-one really knows how this British folk art began. Its origins appear to be in the late 1700s when Britain's inland waterways were at their busiest - similar castle scenes and styles of painting can be found on cheap mass-produced items of the day. ♥ You can show your support for this website by purchasing books/DVDs through the About Canal Art & Narrowboats online affiliate store. 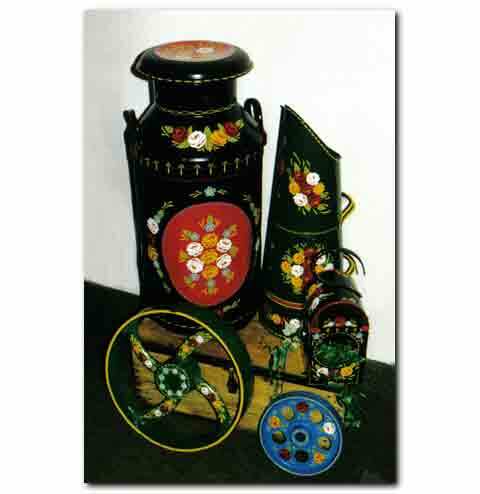 To the right are examples of past works and commissions for hand painted canal ware, featuring Naj's own designs.You can also view some further examples of personalised canal ware on My Depictions blog. Barge ware can be hand painted to order, including small items such as door plaques, plates and house signs. You may find "canal ware" available very cheaply elsewhere. However, sometimes such items may be poorly decorated, lack preparation for painting, or perhaps lack a sealant. Naj's canal art items are highly decorated on all sides, in line with tradition, and designs may be customised/personalised. Only high quality paints are used, care is taken to ensure surfaces are suitably prepared for painting and the canal ware is finished with a sealant. It is not possible to cover costs and offer canal art that meets these standards at bargain basement prices! 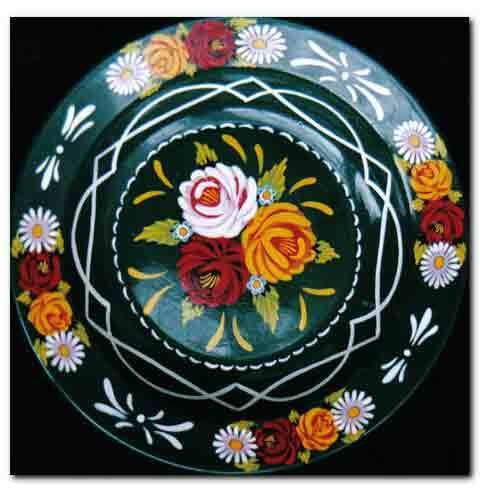 If you are interested in ordering custom canal art ware or have any enquiries, please e-mail. Due to storage limitations, Naj does not maintain a large stock of finished items for selling. She does, however, keep a small collection of popular items suitable for bespoke painting.